"We Care For Your Well Being" – An Initiative by Smt. N.N. Mohan D.A.V. SEN. SEC. 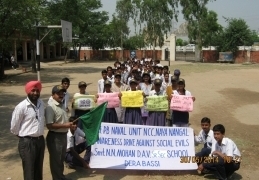 School Derabassi celebrated “No Tobacco Day” on 31st May by organizing a rally at Derabassi to create awareness amongst the localities about the ill effects of tobacco consumption. 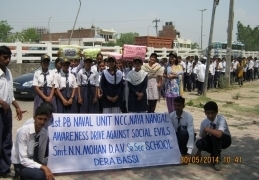 Hundreds of students and staff members enthusiastically took part in the rally, holding banners and distributing pamphlets to the public. 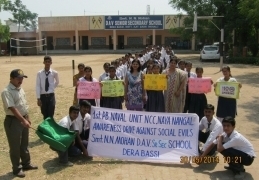 After the rally, the students and the staff formed a human chain at the Derabassi Police Station and shouted slogans against the smoking and the tobacco consumption. The event was a grand success and was successful in putting the message across the public.